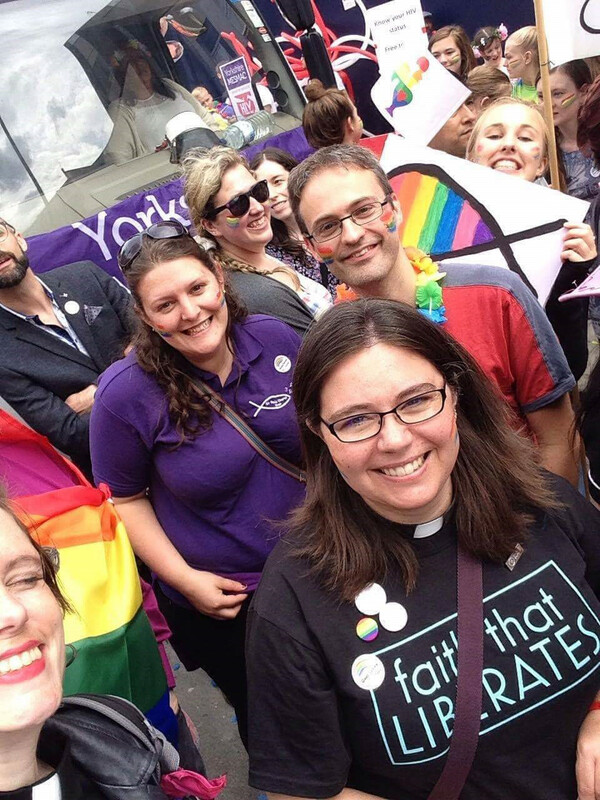 Anthea Colledge, in partnership with Leeds Church Institute (LCI), the White Rose College of Arts and Humanities (WRoCAH) and the University of Leeds conducted some research into why Christian individuals, Churches and groups choose to have a visible presence at the various Pride events. In the last few years, there have been an increasing number of Christians taking part in Pride to enjoy, support, affirm or celebrate Pride. Churches and other Christian groups are visibly present at the events alongside other community groups. They may march in the parade, hold signs or banners along the parade route, hand out water or sweets, or host a stall in the festival park. This type of involvement has come to be loosely described as ‘Christians at Pride’. Why do individual Christians participate in Pride? Why do individuals and groups seek to have a visible Christian presence at Pride? How do the individuals/groups perceive that their participation is received by other people at Pride? How did the organised Christian presence develop in the case study Prides (Leeds, Sheffield, and Hull)? Methods were an online survey plus a small number of semi-structured interviews with Leeds Pride attendees and stakeholders from the case study Christians at Pride groups and national Christians at Pride. 70% of the described reactions were perceived as positive, 8% as negative, and smaller percentages of unclear, mixed, or confused reactions. 11% of the responses were about Christian protestors (both their reactions to the Christians at Pride groups, and reactions by Pride attendees). Offering a counter-narrative to homophobic or non-inclusive Christian teaching, and also to the perception that all Christians are ‘like that’ is a significant motivation for Christian presence at Pride. Christian protestors may be more evident in the media (and the wider experience of affirming groups) than at Pride itself. The vast majority of reported reactions are positive and anxiety about potential negative reactions to an organised Christian presence at Pride is largely unfounded. There is potentially a lack of clarity around the purpose of Pride, especially participation in the parade. This is apparent in discussions about corporate sponsorship of the parade, about the appropriateness of churches participating, and about the allocation of limited parade spaces to LGBT+ people or straight allies. To avoid accusations of hypocrisy and tokenism it is important for organisations that take part in Pride to have a year-round demonstration of support and consider attending smaller and more diverse events. Communication and partnerships can be difficult in a diffuse network where people relate mainly to their own church or group and do not have a strong sense of what is happening outside their own local experiences. There is a tendency for churches and groups to work in parallel with each other rather than together. You can read Anthea Colledge’s final report here. One Response to Why do Christians participate in Pride?